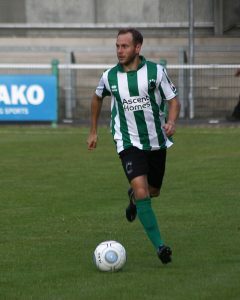 Blyth Spartans left-back Ian Watson hopes to turn the disappointment of the Gateshead defeat into positives ahead of the new National League North season. Son of manager Alun, and former Spartan Luke Armstrong, scored a hat-trick to inflict a 3-1 loss on Blyth – ending their pre-season campaign with three wins, one draw and two defeats. And with the competitive season commencing away to Hereford on Saturday, Watson believes the Heed game has highlighted possible improvements – which can now be taken into the new season. “It’s our last game before the season starts next week so ideally, we wanted to get a win,” said Watson. “It is disappointing – a few things were highlighted. Maybe we needed to communicate a little bit better on the pitch – we were perhaps a little bit quiet. “Obviously, that is highlighted now and we can look to improve it. “First-half, I thought it went in spells. We looked the better side then they looked the better side. It was two good sides trying to play football. “Then after half-time, we’ve come out, again, I think it a little bit like the same – we’ve made changes which disrupts the game slightly. They’ve made changes. Dan Maguire drew Spartans level just after the break before Armstrong added to his first-half strike with goals in the 75th and 88th minute to complete his treble. While Watson admitted Armstrong “probably was the difference” on the day, the former Spennymoor Town man insists Blyth have similar quality having played with Maguire for several years. “I don’t want to be disrespectful to their other players or our centre-forwards, but I will say that Luke is a really good player. He’s really strong, he makes great runs, he never stops – he runs all the time. “I think that’s kind of made the difference on the day for them. His second goal is a great finish, his first was a really good finish – slotting it straight into the bottom corner. “But we’ve got a centre-forward who can do that as well. On his day, he can do just as well as what Luke has done today. Yesterday proved to be a bit more than your standard pre-season game for Watso given he works as a Strength and Conditioning Coach for Gateshead.